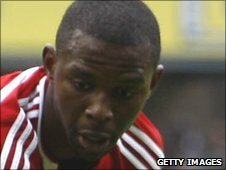 Swindon Town defender Lescinel Jean-Francois could be set for a move to Championship side Swansea City, BBC Wiltshire reports. The 24-year-old Haitian international has been at Swindon since January 2009 after a spell with Guingamp in France. Swansea currently sit fourth in the Championship, level on points with second-placed Cardiff. The former Falkirk man has also been linked with a move to SPL strugglers Hibernian this week.